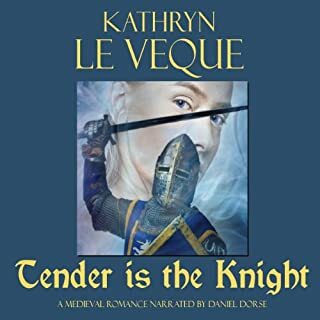 An epic Medieval romance written in the same old-world vein as 'Ivanhoe', this is a tremendously powerful story of Sir Bose de Moray and the Lady Summer du Bonne. But dark rumors follow Bose; his mother-in-law is a vicious woman who blames Bose for her daughter's death. She starts nasty rumors that Bose murdered his wife, and everyone on the tournament circuit is fearful of this dark, frightening knight. Enter the Lady Summer du Bonne. A beautiful woman with a stammering problem, she has been kept hidden away from the world by her embarrassed father and protective brothers. Summer meets Bose at a tournament hosted by her brothers and for Bose, it is love at first sight. But the terrible rumors plague his attempts to get to know the lady, who is attracted to him as well. 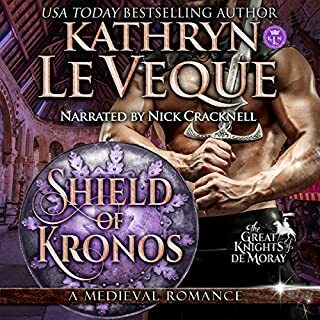 Summer's drunken father eventually pledges his daughter to Bose, but Bose's mother-in-law interferes and Summer's father decides to pledge Summer to an unscrupulous knight who has shown interest in her, and who would like nothing better than to see de Moray come to ruin. With so many forces working against them, Bose and Summer elope but they are captured and Bose is brought up on charges of thievery. A massive trial ensues and with a death sentence hanging over his head, only a miracle can save Bose and restore his honor. KLV brings the medieval world to life! Her knowledge of this period in history is obvious and the details she includes give the story a richness that few other authors can match. 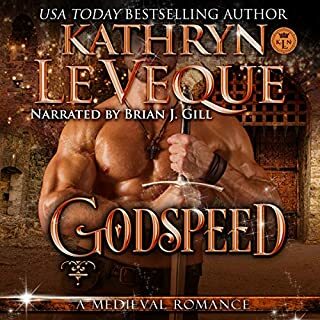 Her descriptions are so vivid you can almost hear the clash of swords and smell the sweat! The romance between Summer and Bose is extremely poignant, as the grieving knight meets the isolated lady. Despite their differences, these 2 lonely souls find a kindred spirit in each other and fall in love. It's a testament to KLV's writing that the love between them is utterly convincing, despite the speed with which it takes place. TH's narration is fantastic! He is a pleasure to listen to and brings the characters life. I'll certainly be looking for more audio books by him. If you could sum up The Gorgon in three words, what would they be? So very different. Unexpected twists, couldn't stop listening. 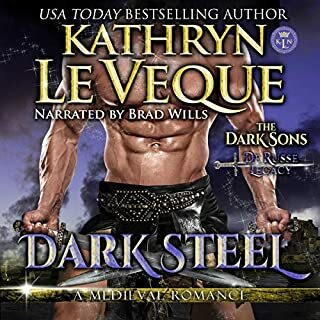 As a recent fan of Kathryn le Veque, I was getting used to male voices with some difficulty as I am normally someone who prefers a female reader.Then along comes Tristan Hunt! 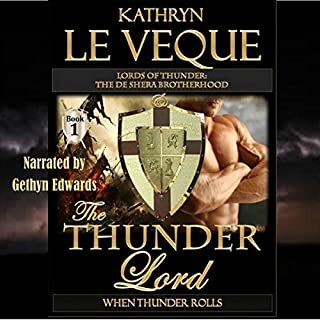 An amazing narrator who does justice to the Author.A silly comment maybe......but this is the first time I have heard a narrator 'read' a stutter and make it so 'natural'.Excellent...........I would love to hear Tristan read more of Kathryn's Books. I think there was a moving moment in evert chapter........can't really choose. I would recommend this audiobook without hesitation! I am a huge fan of Ms. 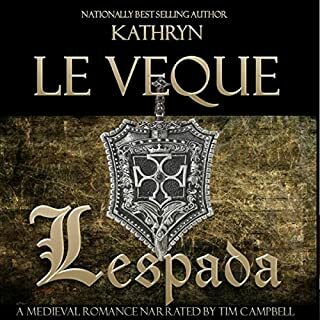 Le Veque's books and I haven't had the chance yet to read it, so listening to it, was perfect for me! Bose is my favorite hero because, he is the perfect knight, passionate and courageous! This narrator has the perfect voice for Ms. 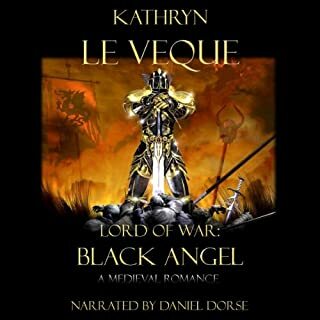 Le Veque's medieval story, a beautiful voice with intonations, fun to listen to, he gets you pulled into the story. Still listening to it, and will edit my review, once, it's all finished! Let's say, I'm always pleased to listen to her audiobooks! 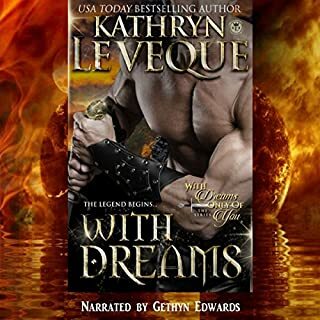 Kathryn's books never disappoint me, I'm always surprised to discover new characters in captivating stories that keep me interested until the end! Such a perfect, sweet love story! Would you listen to The Gorgon again? Why? 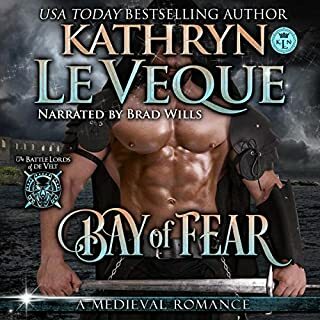 I love the story of the kind knight, Sir Bose de Moray, and his love Lady Summer du Bonne. Bose has had such a difficult past and that all changes when he sees Summer for the first time at a tournament. The story is lovely, the characters are rich, and the plot is filled with intrigue and passion. I loved the voice of Tristan Hunt, he did each character wonderfully with his subtle accent. He also did the voice of Summer well, which surprised me as she has a speech impediment which he handled so nicely that it was not distracting to the audience, but a small part of the story. What other book might you compare The Gorgon to and why? 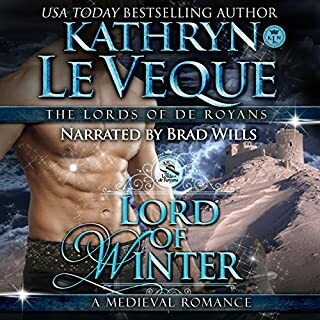 In a way the story reminds me of "Lord of the Shadows" in that the female character is warned off of her knight as she is told by others of the knight's "bad reputation", but instead she disregards rumors and decides for herself. Despite the interference of others, Summer knows that Bose is a good man, just as Sheridan St. James did with her knight, Sir Sean de Lara. In both stories, although they are vastly different, it is the theme of a young woman making her own decision about the direction she wants to take with her life in an age where that was not all that common or expected. No I have not, but I will be looking for more- he was terrific! I felt the disgust and anger that Summer and her siblings felt with her father and his actions! I really loved this story and enjoyed the narrator immensely. I plan to listen to it again. where do I start with this? this book has it all, the knights we love, the ladies we want to be and the crazy family members who we cant wait to get rid of. the book starts off with Summer's father hosting a tournament for her older brother that just became a knight. this is the first one she has ever been too, and is beyond excited. only problem is that she has a stutter, and her family is wasy over protective of her. this is where she meets our Hero, Bose. he trys to ask for her favor, and she is smitten at once. but her sister in law shoos him away. the rest of the story is set on the same lines. them fighting to be together, someone always trying to keep them apart. What made the experience of listening to The Gorgon the most enjoyable? 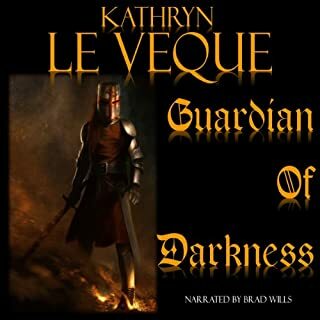 I read the book first, but the audio was superb. In this story Summer had a stammering issue and I thought Tristan Hunt brought this story to life because he did so well with her character. This book was different than most of KLV's books because of this so called "defect". Summer's stammering made her "unmarriageable" material in the eyes of her father and society in that time period. Although she was very much loved by her brothers & sister-in-law, their protectiveness kept her from living her life. 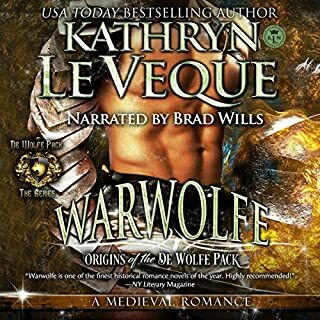 This is the first audio I had purchased with Tristan Hunt as the narrator and I thought he was EXCEPTIONAL! Bose de Moray's reaction and belief in Summer was extraordinary. Swoon worthy! Summer's brothers were so funny! Yes, I would! The story is wonderful despite it's title and the play on the greek female monster Summer du Bonne the heroine first spies Bose de Moray the hero at her brother's tournament and it is love at first sight; but their love is filled with uncertainty Summer maybe beautiful but also hides a defect and Bose hides secrets that could threaten their love for sure. There is humor, a strong family bond, a beautiful imperfect maiden, a playful ferret, a horrible mother-in-law, villains, a great story, fascinating minor characters and a menacing mysterious handsome hero which you can't help but love all rolled into this beautiful romance. What was one of the most memorable moments of The Gorgon? For me yes there are several but the one that really sticks out in my mind the most and is one of my most favorite parts is when King Henry comes to save the day bringing his army, old friends of Bose, Summer's brothers and even the villian's brother all come to Bose defense for his trial to speak up for him and all in the name of love! 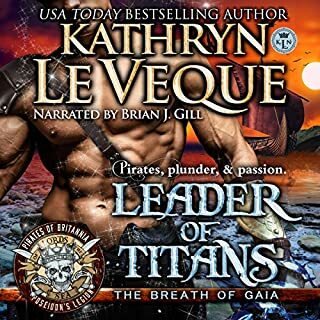 I loved Mr. Tristan Hunt's voice even though this is the first audio book of his that I have listened to that he has narrated. He does a wonderful job portraying other characters giving them their own distinct voice. He makes the hero sound dark, menacing with a touch of dry wit to it but there is also an entrancing quality to it as well. I have also never listened to someone pull off a stutter so believably and effectively for the heroine that I am amazed he can do it so well! I would definitely get more audiobooks if he decides to do more narrations. He really does bring the book to life! I really enjoyed all the emotions this book brought about while reading it. It seemed I spent a lot of time smiling and laughing not at the character's expense but at certain situations. I myself had a speech impediment when I was younger so I can totally associate with Summer even Margot had some traits of my own mom. I don't think I really cried over anyone I do think one part that made me mad that I think I cried in outrage was when Margot attempted to stab and kill Bose at this point she seemed harmless but now I actually got to see her for what she truly was a vile horrible person who was bent on revenge and hatred. 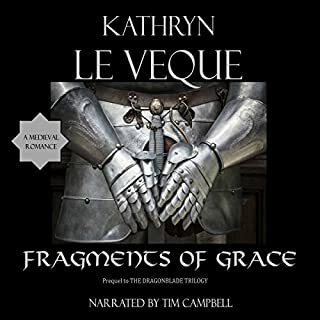 I really do hope that Mr. Tristan Hunt does more narrations for other audiobooks and I would definitely get more audiobooks too because I really did enjoy listening to his deep throaty beautiful mesmerizing voice! Brilliant! Captivating! Thrilling! A story with characters strong yet vulnerable who take you to sublime moments, so poignant your heart is wrenched from its very place! 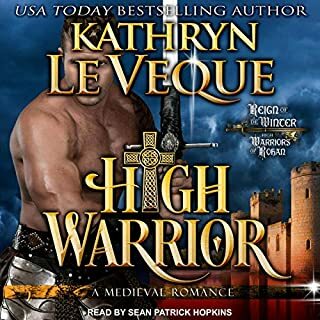 All of Kathyrn Le Veque’s work grips the very essence of the reader, whether in agony, sorrow or glory – her use of words and rich characters will have you take flight into medieval worlds so real you never want to leave! This is a story where love brings great happiness, yet the journey to attain what it encompasses is painful—forces of greed work its best to succumb and overturn what good man desires to attain. Will the honor of a knight remain steadfast? 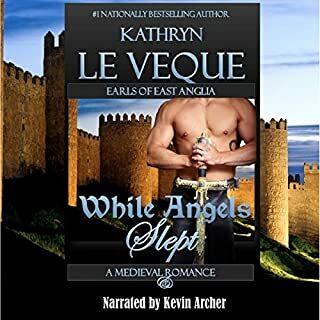 Beautifully rendered, and a must for those who love medieval history, romance and who thrive on stories which seem impossibly able to end well. Yet….in Ms. Le Veque’s world, you are left smiling and fulfilled. Narrator Tristan Hunt only enhances the story, never gets in the way of events doing an excellent job fleshing out characters and emotions. I wouldn’t hesitate to listen to other narrations from him. I enjoyed the setting of the tournament circuit and the characters were all very interesting in their own right. I very much enjoyed the narration of this book. The narrator reminded me of Alan Rickmana little. None of the characters were over played particularly impressive was the portrayal of Summers stutter soft and subtle. I will enjoy listening to more from him. This was an earlier LeVeque novel. Despite the male heroe's name, it was not as heavy and dark as most of her novels. Thus, I considered this selection a "light" read. always entertained by her engaging stories. 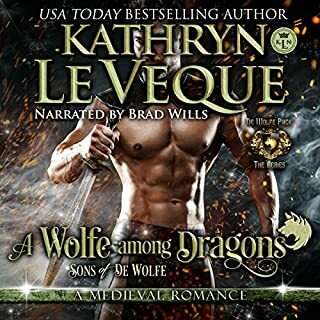 I highly recommend this author to lovers of medieval romance.